Every now and then you’ll see house and land packages which have these cash back offers. It might be a $3,000 cash backs, might be a $5,000 cash back, 10, 15 even $30 000 cash back. Builders may also offer things like a free car or a free holiday to help you get across the line and to sign that deal. So today I wanted to talk about some of the major risks of these houses and land cash back offers, and how you can start thinking about them so maybe you don’t get trapped by this incentive offers. 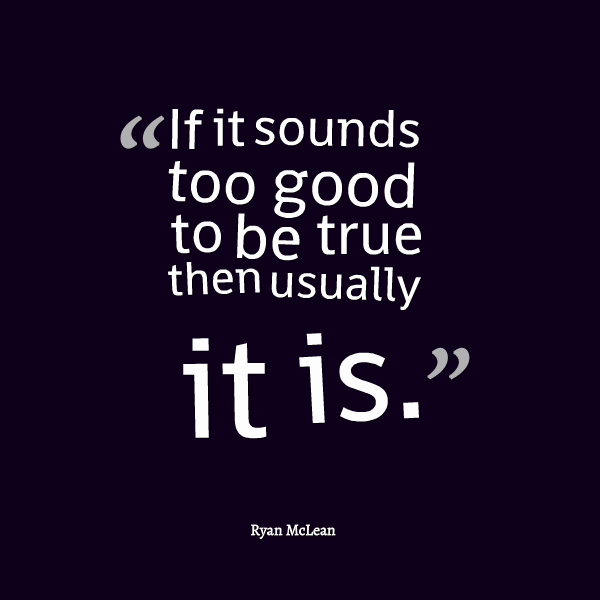 If it sounds too good to be true then usually it is. We all know that saying! If builders offer these cash backs, they’re going to have to make that money back somehow. Try to think of it as a business. These people aren’t just out there to be generous and to offer you the deal of a life time. They’re out there to make money and if they’re offering these cash backs, usually it means that times are hard and it’s difficult to sell these properties. So you need to take that into consideration. 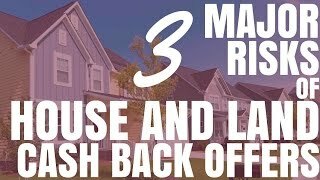 House and land cash backs occur when you purchase a house and land package, maybe from a builder or a developer, and you purchase it for a set price and you get a cash back on that. Either when you sign or when you pay a deposit or at the completion and handover of the property. So you might pay $600,000 and you get $30,000 cash back. So realistically you’ve paid $570 000 for the property but you’ve actually paid $600,000 and got $30,000 back. So what it is it’s just a way to incentivise you to go ahead and purchase because you’re getting this cash back. Why do property developers offer cash backs? Property developers tend to offer cash backs when times are tough and when they want to move their properties and when they want to sell them. And so they use these incentives to get people across the line. We’ve seen it in a car industry for many years where they’ll offer a $3,000 cash back or whatever it is to purchase cars on finance and then get $3,000 cash back. And so it’s a technique that’s used to make product move, so developers are just trying to make their product move. We saw that very commonly in the height of the GFC when a lot of developers were doing this. To me it puts off alarm bells in my head as soon as I see it. What are the risks in these house and land cash back offers? So let’s have a look at 3 major risks with these cash back offers. Number 1 is obviously a higher initial price. Because you’re getting a certain amount of money back, what’s to say that a builder or a developer hasn’t added that on to the final price? So let’s say the example of $600,000 property. Let’s say that property is actually only worth $570,000. Well that builder could jack up the price to $600,000 and then provide you with $30,000 cash back. So really he’s still getting the money that he wants, the value of the property which is $570 000, but you’re getting this cash back and you feel like you’ve got a great deal. So you could be getting stung with a higher initial price. Number 2 is the risk of bank revaluation or bank valuation when you purchase the property. So the bank will usually take the cash back into account and deduct that from the value of the property. If you’re purchasing a property for $600,000 and getting $30,000 cash back the bank is actually going to value that property at $570,000. So if you think that the cash back is going to act as your deposit, well then you need to think again because the bank won’t count that as the value of the property, it will count it as $570,000 and then you’ll need to come out with the deposit yourself. The builders and the developers need to make their money back somehow. As we said they’re probably not just doing this out of kindness of their heart – they’re in a business, they want to make a profit, they need to feed their families. So if they’re giving away this money upfront, they need a way to make it on a back end. In some cases they may overcharge you on variations. So changing the plan slightly, adding something extra in, changing the way the layout happens – all of these variations could cost you an excessive amount of money after you’ve purchased the property. So make sure all the changes that you want to make, everything that you want done, that’s going to be different from the original plan is set out before the contract is signed and look at getting a fixed contract where you have a set amount that you have to pay rather than one that can accumulate and can get bigger over time. Fixed contracts can always be a good idea to help minimize your risk. Can you keep the cash back hidden? Well the answer to that is no, not really. You might be keep it hidden from your spouse or something like that which I don’t advise that you do but when it comes to banks and lenders there are clauses where they can find this out very easily. So it is basically impossible to keep this hidden from your lender, and if you do it is in most cases considered fraud. So it’s not advised that you go ahead and do this. It will be in the sale of contract and the banks can find it out through that easily or through many other methods that they use as well. It’s not something that you can keep hidden so that you can use it as your deposit. It’s something that the banks will readily see and therefore discount the property accordingly. So what’s the solution – should we take advantage of these deals or should we stay clear of them? The answer is – simply do your research. I advise this to people with every property…go ahead and do your research. Research the area, research the properties in the area, what are the valuations, what are properties like this sold for, what are comparable price ranges – all of these sorts of things. We want to look at the and, we want to do our research and rather than making that emotional decision ‘Oh, it’s got a cash back, it’s a great deal! Let’s go ahead and do it, quick quick quick! We need act now otherwise there’s only two lots left and they’re going to be sold!’… Scarcity is a tactic that marketers use to sell more product. I know, I use it myself every now and then. Make something scarce and it becomes more valuable. So relax, don’t get emotional and just research the market, analyze it and discover for yourself whether this is actually a good deal or not. Don’t just take the salesmen’s word for it. If you want to know how to research and so that you can know if these deals are good or not, then we’ve got a module dedicated to that – I think it’s about 6 tutorial videos on different things you can do to research an area.